Despite using an estimated 57 sheets per day, most of us probably never give a second thought to the origins of toilet tissue or paper towels. Americans are the world’s most prolific toilet tissue flushers, at an estimated 22 kilos per person per year. Germans by comparison, flush around 12 kilos. While Australians don’t figure in these astounding statistics it’s interesting to ponder where our ‘kilo per person’ usage might place us. Perhaps like us, you’d be surprised to learn that any hand towels and toilet paper are still made from freshly felled plantation and native forest timbers. In fact toilet paper alone accounts for around 10% of the 270,000 trees culled every day to feed global paper production. Tragically much of this paper comes from rainforests in the developing world. The ecological consequences of this destruction – erosion, pollution, and loss of human and animal habitat are well documented, as are the complex economic imperatives that drive it. We are proud to offer washroom paper products made from 100% post consumer waste, sourced primarily from recycled office paper. We’re also careful to distinguish between genuine post consumer waste products and others labeled ‘recycled’ but made from the byproducts of virgin timber processing. do things by halves – in a good way. Recycling paper uses less of pretty much everything we need to conserve. Making a tonne of recycled paper uses 64% less energy and 50% less water than a comparable volume of virgin forest paper. It also creates a massive 74% less air pollution, saves around 17 trees, 2.5 barrels of oil and 4 cubic metres of landfill. feel the difference – not so much. Historically, recycled tissues and toilet paper had a difficult reputation for being thin, scratchy and non-absorbent. When compared to their softer, whiter, delicately fragranced competitors, recycled products lacked the ‘luxe’ factor. Happily for triple bottom lines everywhere, this is no longer the case. Improved production processes mean that you can now buy equally soft, competitively priced, earth friendly toilet paper and hand towels. While they may not be quite as snow tinged as their rivals, recycled products are bleach, dye and fragrance free making them safer for skin, septic systems and ultimately for waterways and wildlife. make market magic – create demand for recycled 100% post consumer waste products. Help protect the viability of a key green industry by ensuring sustainable prices for great products. 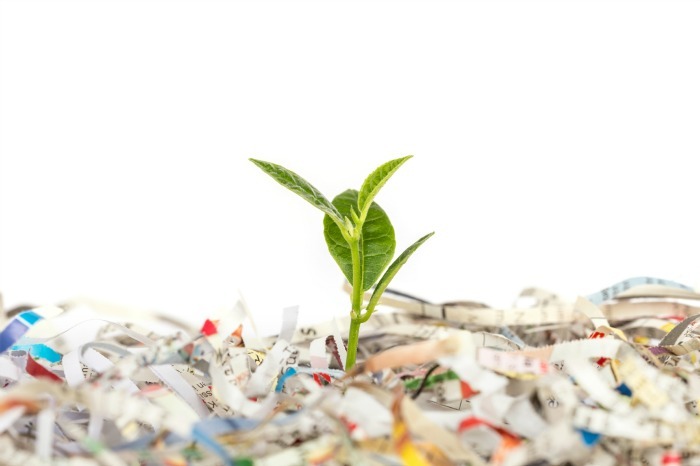 Paper recycling plants also create jobs at a rate of five to one compared with the heavily automated plants producing virgin paper. Some green choices are easier than others and some of the simplest switches can make a massive difference. Swapping virgin forest toilet tissue and hand towels for comparable quality products made from 100% post consumer waste is one of these options. Global flushing of countless kilos of tissue isn’t going to stop anytime soon, so why not choose a more earth friendly paper? We predict that you wont feel the difference but you’ll definitely be making one. Keen to act on this significant tissue? We’d love to help.